The recreational opportunities listed on the webpage for Nehalem Bay are brought to you by www.clamdigging.info for the benefit of the members of the Clam Digging and Crabbing Community. Nehalem Bay, Oregon’s fourth largest bay and one of Oregon's premier crabbing bays and for digging large soft shell clams. Crabbing, fishing for salmon and steelhead and digging for softshell clams is very popular because of the bays proximity to Portland. The emphasis in Nehalem Bay is on crabbing and salmon fishing. Fishing for salmon is excellent outside the jetty jaws but only do so in seaworthy boats. Surprisingly the fish species usually associated with most of Oregon’s developed deep water bays are not found in Nehalem Bay in great enough numbers to fish for them on a consistent basis. Crabbing, fishing for salmon and steelhead and digging for softshell clams are all very popular. The entrance to Nehalem Bay at times becomes very rough and dangerous to cross. Nehalem Bay does not have a Coast Guard station or Bar Advisory Signs. During the summer, the Coast Guard broadcasts bar conditions on VHF channels 16 and 22A but only when a Coast Guard boat is patrolling the area. The USCG are heavy users of the Marine VHF Channels; Channel 16 is reserved for distress, safety and calling, while channel 22A is utilized for special warnings, Marine Safety and other announcements. A whistle buoy is located 1 mile west of the entrance to bar at Nehalem Bay. The small boater has to use caution when considering crossing the bar or fishing in the jetty channel during the outgoing tide. The south jetty extends seaward for 600 yards. The following underlined areas describes some of tidal conditions when boating in the jetty channel or crossing the bar at Nehalem Bay. Crab Rock: Crab Rock is located about 150 yards southeast of Jetty Fisheries Resort docks and is a hazard to small boats when it is covered by water. The hazard is sometimes marked by a privately maintained red buoy just westward of the rock. If the buoy is present, stay to the right of it when outbound and to the left when inbound. Bar area: The entire area between the beach and the 30-foot curve is bar area and breaks on the ebbing current. The safest channel across the bar is subject to frequent change. Boaters proceeding out should stop just inside the entrance and carefully evaluate the bar. If the bar is breaking, do not cross. If you decide to cross, pick the calmest area and proceed, but do not attempt to turn around if the bar is breaking. Entrance: The best water is close to the south jetty. The channel seaward of the jetties is continually shifting, and familiarity is needed to cross it safely. The range markers, therefore, do not necessarily show the exact channel and can also become obstructed by trees. 46.5 The North Nehalem Fish Hatchery is accessed by traveling north on Hwy 101 and turning east on Hwy 53 or by traveling west from Portland on Hwy 26 and turning southwest on Hwy 53 to access the Nehalem Fish Hatchery. The Nehalem Fish Hatchery offers fishing opportunity for the disabled from the deck of the fishing platform for salmon and steelhead. The Salmonberry Trail is 86 miles of adventure from Banks to Tillamook. Oregon's hiking, cycling, and equestrian trail. For its entirety, the trail follows the century-old Pacific Railway and Navigation Company rail bed, which—due to its steep grades and sharp curves—gained the moniker, “Punk, Rotten and Nasty.” Relicts of its railroad heritage include 13 railroad tunnels and dozens of trestles, including the Big Baldwin Bridge, which offers a stunning view. The east end of the trail will begin in the pastoral community of Banks at the foothills of the Coast Range. Here, it will connect to the popular 22-mile Banks-Vernonia State Trail, Oregon’s first rail-trail. The western half of the trail, from Enright to Tillamook, will parallel an active line, the Oregon Coast Scenic Railroad, in a scenario known as rail-with-trail. The organization offers tourist excursions down the coast using vintage locomotives and an all-volunteer crew. The trail will end on the south side of Tillamook at the Port of Tillamook Bay’s Industrial Park, which includes an air museum that once served as a blimp hanger and, today, showcases various types of aircraft. Access to the Salmonberry trailhead is gained by turning east onto Hwy 53 just north of Wheeler, OR. Continue to the Miami River Road. Turn right and proceed to Foss Road. Turn left at Foss Road to the Salmonberry trailhead at the Buick Creek Bridge. Nehalem Bay clam digging is very good but limited to softshell clams, purple varnish clams and butter clams. Large softshell clams are from the north shore across the bay from the Wheeler Marina following the instructions of Jim the owner of Wheeler Marina. The purple varnish clams are dug from the tidal flats associated with the Nehalem State Park Boat ramp. We thank clam digger, Dun and his family for sharing the photos of the clams they dug. 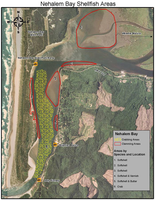 Click on the image of the ODFW map of the clam digging distribution and crabbing map to view the crabbing tidal areas of Nehalem Bay. Double click the image to increase the image size. 47.0 The City of Wheeler The city with the million dollar view. On 4/01 Jim from Wheeler Marina reports: that he will begin renting boats for crabbing and fishing in preparation for the coming season opener prior to Memorial Day. He also went on to say that there has been good winter and Spring crabbing this year.. Fishing for salmon this year has been disappointing with the catch rate not meeting expectations. The annual run of July Chinooks have once again failed to show up, but fall run Chinook salmon fishing has improved. Kelly's /Brighton Marina On 3/16 Kelly reports: Crabbing is producing good catches during the incoming tide wit catches of 20,16 and 13 per rental boats. The last rental boat to come in had take only 2 crabs. Kelly says crabbing is best during periods of Neap tides during the incoming tide and periods of high salinity. The Jetty Fisher located at the mouth of Nehalem Bay. Crabbing from the Jetty Fishery crabbing dock as shown in the video taken earlier this summer is great. The crabs enter Nehalem Bay along the channel that runs along the south side of the jetty channel and right into the crab rings at the Jetty Fishery Dock. The crabbing dock is closed at 5:00 pm. Chinook salmon return to Nehalem Bay in small numbers beginning the first week of July and in some years depending on the number of returning fish the fishing can be as hot as a 4th of July fireworks show. The summer run peaks in early August. The first week of September usually signals the return of the fall Chinook run. Fall Chinook salmon are present in Nehalem Bay and lower tidal reach of the Nehalem River from September peaking in early October before declining in November. The age class of the returning Chinook is usually comprised of mature 5 year old fish. Fish for the summer and fall runs using the same tackle and techniques. The best fishing for newly arriving fall Chinook salmon occurs in the lower bay during the incoming tide of the major tidal exchange of spring tides or neap tides especially when the incoming tide coincides with sunrise or sunset. The next most productive fishing period occurs at sunrise or sunset during the incoming tide of the minor tidal exchange in the daily tidal cycle. Daybreak is that magical time of day when Chinook salmon bite the best. Be sure to have the bait in the water one half hour before sunrise. Fishing is most productive from ½ hour before sunrise to midmorning and from late afternoon until ½ hour after sunset. Early in the run troll a plug cut herring with or against the incoming tide or with outgoing tide from Fishery Point seaward. Troll the plug cut herring in the channel that parallels the east shore and the south jetty. The velocity of the tidal current in the lower bay requires the use of heavy sinkers up to 12 plus ounces to keep the bait in the Chinook’s strike zone. As the number of returning Chinook salmon increase troll a plug cut herring or a bait wrapped Flatfish lure colored with a silver body and chartreuse head or Hot Tail finish in the deepwater channel in the bend of river at the Community of Wheeler or in the channel opposite of Deer Island. Remember Chinook salmon often bite prior to and after the tide change. As high tide approaches, Chinook salmon will often mill around in the area between the Community of Wheeler and Fishery Point. Trolling a rainbow colored spinner such as the Yaquina Slammer on the tidal flats just above the deepwater channel during a last hour of the incoming tide often produces fish. Troll with the incoming tide or back troll, back bounce or troll with the outgoing tide from the Highway 101 Bridge to the confluence with the North Fork using a plug cut herring, bait wrapped Flatfish lures or with spinners. The depth of the channel above Fishery Point varies with the contour of the bottom and underscores the importance of using LCD marine electronics. Increase the trolling speed in the shallow water reach of the channel lifting the bait in the water column to avoid hanging it up on the bottom. Lower the trolling speed as the channel deepens. Chinook salmon often react to the change of speed by striking the bait. Anchor on the up current side of the deeper holes located from the Highway 101 Bridge upstream to the head of tidewater at the Roy Creek County Park. Fishing on the bottom with bait wrapped Flatfish lures, spinner bait combinations, spinners, bait sweetened Spin–N–Glos, wobblers or with a walnut sized gob of salmon eggs are effective options. Bobber fish through the deeper holes from the head of tidewater at Roy Creek County Park to the Highway 101 bridge during the last half of an outgoing tide through slack tide using a gob of salmon eggs the size of a walnut and sand shrimp. The most productive holes are located just above and below Roy Creek Park and the reach of the river upstream from the confluence with the North Fork. Information Report 99-4. Zhou, S., and R. Williams. 1999. Stock and recruitment analysis and escapement goals for Nehalem River fall Chinook. Coho salmon return to Nehalem Bay from late July but in fishable numbers from August into September, peaking in September before declining in October into November. Fish early in the run in the lower bay from Fishery Point seaward trolling plug cut herring, hoochies or a streamer flies with the incoming tide. Troll these baits with a diver or wire spreader or diver in the upper half of the water column. Troll in the upper bay with rainbow, chartreuse or pink colored spinners or with spinner bait combinations. Steelhead fishing in the Nehalem basin offers abundant steelhead fishing opportunities. Hatchery steelhead (90,000 smolts) are released in the North Fork Nehalem at or below Nehalem Hatchery on Hwy 53. The best fishing for hatchery steelhead is usually in December and January, with the first fish appearing by mid-November most years. Hatchery steelhead are recycled regularly from Nehalem Hatchery during the peak of the run. Call 503-368-5670 for recorded fishing information. Fishing for wild steelhead in February and March can be productive and it’s usually much less crowded. ODFW will be conducting a radio telemetry study of steelhead migration patterns beginning in December 2013. Anglers may catch steelhead with a radio tag antenna protruding from the mouth. A temporary rule for this winter allows anglers to keep hatchery steelhead that have been radio tagged. Anglers are asked to return the radio tag to ODFW (drop off at Nehalem Hatchery or other ODFW office) so that it can be re-used. Do not remove radio tags from steelhead that are released. Anglers may also encounter steelhead with Floy tags inserted near the dorsal fin. Please report these fish to ODFW, including any numbers on the tags (if present). Bank access on the North Fork is available near the hatchery and on neighboring industrial forestlands. The Nehalem Hatchery Barrier Free Fishing Platform offers additional access to anglers with a disabled angler permit. Boaters may float the North Fork below the hatchery, but extreme caution is necessary. Several bedrock rapids make drifting this river hazardous, and it should be attempted by only experienced boaters. Rafts are highly recommended. The main Nehalem River is a very productive catch-and-release fishery for wild steelhead. Best fishing is February to early April. Some very large steelhead (occasionally topping 20 pounds) are caught from this river. Access is along Nehalem River Road. The lower river can be boated from the Beaver Slide (below Nehalem Falls) to Roy Creek County Park. The Salmonberry River, a tributary of the Nehalem about 7 miles above Nehalem Falls, can provide superb fishing for large winter steelhead. The Salmonberry closes March 31. Access to the Salmonberry remains limited. The Nehalem River Road bridge over the Salmonberry has been rebuilt and is now open; however, the railroad right of way remains closed to public access. Anglers are advised to check with the Port for current status of access restrictions. Cutthroat trout return to the Nehalem River Basin beginning as early as the middle of July but most often from August through September. Fish from the Community of Wheeler to the confluence of the North Fork from middle of July into September trolling Doc Shelton spinners rigged with night crawlers. Fish in the upper tidal reach of the North Fork or in the main stem Nehalem River using night crawlers, crawfish tails or by casting ¼ ounce yellow or white Roostertail spinners. Black rockfish enter Nehalem Bay from April through October but withdraw from the bay during periods of heavy freshwater runoff from seasonal storms from November through March and into deeper water during the daylight hours. The fishing is for black and blue rockfish is the most inconsistent for any of Oregon’s large bays. Historic and current catch statistics reflect the poor fishing. The most productive fishing should occur in the jetty channel during the incoming tide shortly after sunset. Striped seaperch, pileperch, walleye surfperch, redtail surfperch and white seaperch enter the bay in late spring. Schools of perch move onto the tidal flats feeding heavily on intertidal animals. The fishing ranges from fair to excellent through fall depending on the tides and the weather conditions. When the dynamics of the tide are at work in the bay, fish in the area of current breaks whirlpools and rip tides. At times, during the incoming or outgoing tide, current lines appear between the tidal flats and the adjacent deeper water. Use the current lines as a guide to the channels that drain the tidal flats. To assure success the angler should tour the bay during low tide to identify the locations where perch can be intercepted during the incoming tide. Low tide also provides the angler the opportunity to pump shrimp. Fish for perch in the channel along the south jetty and around Crab Rock. Fish in the main channel along the east shore from the Jetty Fishery upstream to the railroad trestle above Fishery Point. Fish along main channel that drains the tidal flats of the north shore from the Oregon State Park to the community of Wheeler. Kelp greenling, whitespotted greenling and rock greenling enter the bay in small numbers with the tide. The fishing is rated fair at best, and the best fishing occurs late spring through summer months in the channel along the south jetty. White sturgeon enter Nehalem Bay from the middle of December through July. Typically, fishing is intermittent from day to day ranging from poor one day to excellent the next. The sturgeon fishery ranks 5th overall when compared to Oregon’s other bays averaging 74 fish per year. The most productive baits are mud and/or sand shrimp. The best locations to fish are on the south end of Deer Island and Dean’s Point. Sturgeon are also caught in the holes along the south shore between Fishery Point and the community of Wheeler. One of the better locations is the Airport Hole, which is located on the south side of the airport near Nehalem State Park. Fish the deeper holes in the river channel to the head of tidewater. Lingcod spawn along the outer portion of south jetty from late January through April. The best fishing should occur during the peak of the spawning period from late February through early April but the fishing is rated inconsistent at best. Cabezon should be present in the rocky structure of the south jetty but the fishing is inconsistent. Bank fishing for salmon from the Nehalem Bay State Park using bobbers or by casting spinners from shore. Plunking for salmon with sand shrimp and/or salmon eggs is also productive, but the crabs often eat the bait before the salmon can take it. Fish for perch from the railroad trestle above Fishery Point or from Brighton seaward to the south jetty but access is limited by private property. Nehalem Bay boat launches on the south shore are the Jetty Fishery, the Brighton boat ramp, the Paradise Cove Resort, the Wheeler Public boat launch and the Nehalem Bay boat ramp. The North shore boat launch is located at Nehalem Bay State Park. Launch at Roy Creek Park to access the head of tidewater. Roy Creek Park is located off of Foss Road via State Hwy 53. Click on the following link List of Oregon State Parks with partial or complete closure. Then click on the All Parks box and scroll down to the Stat Park of interest. Click on the Oregon Coast Today to view the current events of interest to all on the Oregon Coast. Click on the Tbone tidal projections for the Nehalem River Estuary at Brighton. Click on the NOAA tidal projections for the Brighton area of Nehalem Bay. Click on the local weather forecast for Nehalem Bay and surronding area. Always call the Oregon Shellfish Hotline at (503) 986-4728 or 1-800-448-2474 toll free outside of Oregon before harvesting crabs, clams, mussels or other shellfish for messages listing the areas closed to harvesting crabs or shellfish due to high levels of marine toxins. Fish and Shellfish Consumption Advisories and Guidelines The State has issued shellfish advisories for elevated levels of arsenic in soft shell clams and gaper clams. The CDAO does not recommend consuming contaminated clams or fish species of any species. The Oregon Health Authority has prepared a series of asked and answered questions about the soft shell clams taken from Oregon's Bays. Click on Questions and Answers (pdf).